Introduction: Isolated tubercular liver abscess without any other foci of infection is an extremely rare presentation of tuberculosis with a prevalence of only 0.34%. The diagnosis can be extremely challenging on account of the non specific presentation and is frequently confused with hepatoma, pyogenic liver abscess or amoebic liver abscess. Case Presentation: A 44 year old man presented with non specific complaints of low grade fever, weight loss and vague abdominal pain. Ultrasonography of the abdomen revealed a collection in the liver with few adhesions in the bowel loop. A contrast enhanced CT scan of the abdomen proved it to be a loculated subcapsular abscess of the liver. A CT guided fine needle aspiration from the collection showed suppurative material with acid fast bacilli, singly and in clumps. Except for a mild derangement of liver function tests, all other blood tests were normal. The patient was started on anti-tubercular therapy with the diagnosis of a tubercular subcapsular abscess of the liver. Conclusion: Although tubercular liver abscess is very rare, it should be included in differential diagnosis of liver abscess and undiagnosed hepatic mass lesions. Appropriate investigations should be done to establish a definitive diagnosis to initiate appropriate therapy. Hepatic involvement in tuberculosis is usually noted in association with pulmonary disease or miliary tuberculosis. However, isolated hepatic tuberculosis in the absence of any other organ involvement is extremely uncommon even in a tubercular endemic country like India. Isolated tubercular liver abscesses (TLA) are even rarer and is seen in only 0.34% of cases with hepatic tuberculosis . The diagnosis is difficult in most instances and is frequently confused with hepatoma, pyogenic liver abscess or amoebic liver abscess [2,3]. We hereby report an extremely rare case of an isolated tubercular subcapsular liver abscess in an immunocompetent adult without any other foci of tuberculosis either in the lung or elsewhere. A 44 year old male presented to the out-patient department of our hospital with the complaints of low grade fever with primarily evening rise in temperature along with a history of weight loss for past two months. He also complained of vague right upper abdominal pain which was non-radiating and nature for the past one month. He had no significant past medical history. He was a non-smoker, non- alcoholic and consumed non-vegetarian food. He denied any history of cough and had no history of contact with tuberculosis. He had no history of travel in the recent past and had no history of drug intake, substance abuse or allergy to medications. On examination he was febrile (oral temperature 1000F), with a blood pressure of 100/70 mm of Hg, pulse rate of 80/min and a respiratory rate of 14/min. There was no pallor, cyanosis, edema or lymphadenopathy. The neck veins were normal. On systemic examination there was mild tenderness of the right upper quadrant of the abdomen. The abdominal examination was otherwise normal with no clinically detectable organomegaly. Rest of the systemic examination was normal. The investigations (Table 1) showed a hemoglobin of 11.8 g/dl and a total count of 10,300/mm3 with 50% polymorphs and 49% lymphocytes. The erythrocyte sedimentation rate was 65 mm/ hour. Liver function tests showed mildly elevated liver enzymes and an increased alkaline phosphatase level. Renal functions and coagulogram were normal. Serological markers for Hepatitis B, Hepatitis C and HIV were non reactive. Chest X ray was normal. Ultrasonography of the abdomen showed a collection in the liver along with few adhesions of the bowel loop. For further evaluation, a Contrast Enhanced Computed Tomographic (CECT) scan of the abdomen was done which showed a loculated subcapsular collection anterior to segment III and V of the liver with scalloping of the liver margins which was suggestive of a subcapsular abscess of the liver (Figure 1). A CT guided fine needle aspiration cytology was done from the abscess which showed sheets of neutrophils suggestive of suppurative necrosis on giemsa staining (Figure 2) along with acid-fast bacilli on Ziehl Neelsen staining (Figure 3). Bacteriological and fungal cultures from the aspirate were sterile. A postero-anterior view chest X-ray was done exclude associated pulmonary tuberculosis (Figure 4). 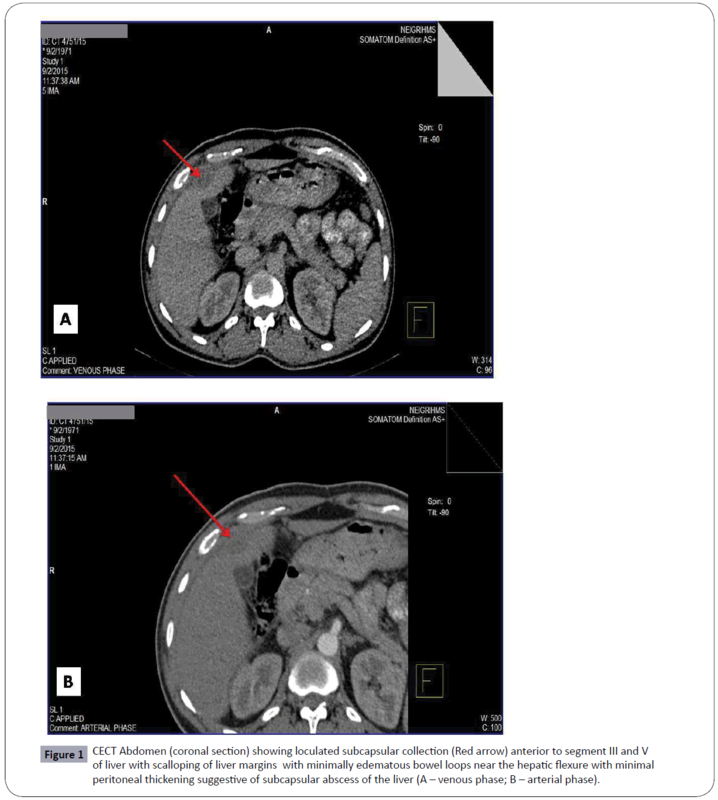 Based on the clinical features and laboratory findings a diagnosis of isolated tubercular subcapsular liver abscess was made and the patient was started on anti-tubercular therapy (ATT) with gradual resolution of symptoms within a few days. Table 1: Showing laboratory findings in the patient with tubercular subcapsular liver abscess. Figure 1: CECT Abdomen (coronal section) showing loculated subcapsular collection (Red arrow) anterior to segment III and V of liver with scalloping of liver margins with minimally edematous bowel loops near the hepatic flexure with minimal peritoneal thickening suggestive of subcapsular abscess of the liver (A – venous phase; B – arterial phase). 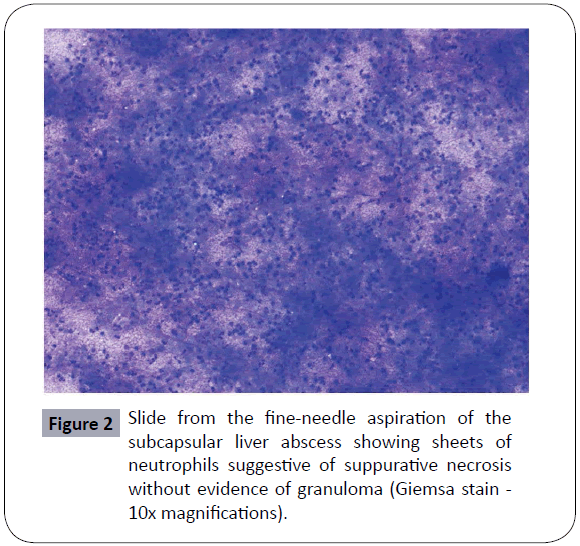 Figure 2: Slide from the fine-needle aspiration of the subcapsular liver abscess showing sheets of neutrophils suggestive of suppurative necrosis without evidence of granuloma (Giemsa stain - 10x magnifications). 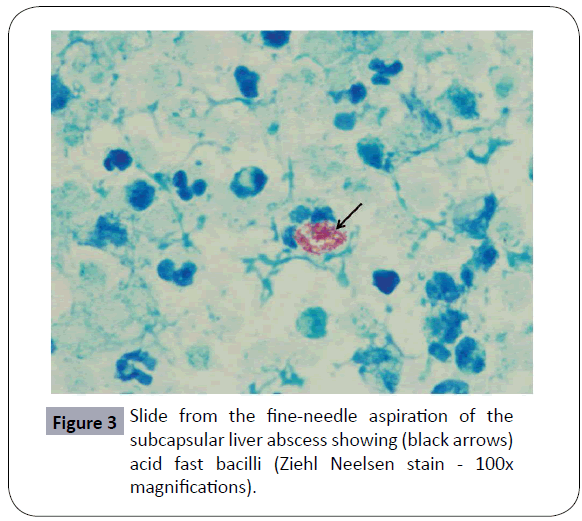 Figure 3: Slide from the fine-needle aspiration of the subcapsular liver abscess showing (black arrows) acid fast bacilli (Ziehl Neelsen stain - 100x magnifications). 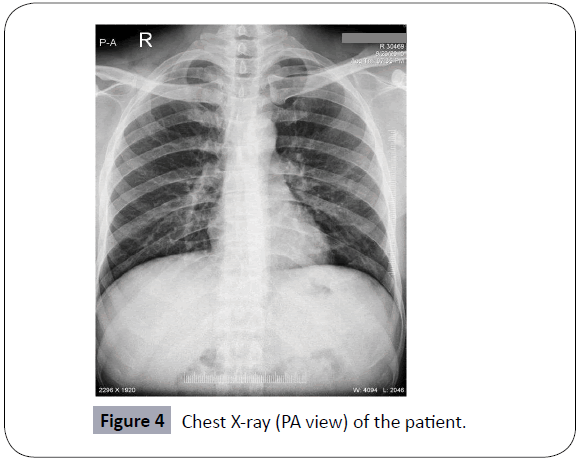 Figure 4: Chest X-ray (PA view) of the patient. There are three forms of hepatic involvement noted in tuberculosis, (i) diffuse hepatic involvement seen along with pulmonary or miliary tuberculosis; (ii) diffuse hepatic infiltration without recognizable pulmonary involvement (granulomatous hepatitis) and (iii) focal tuberculoma or abscess, which is a much rarer form . Bristowe first described TLA in 1858 . Most of the cases that have been described usually occur in association with miliary tuberculosis, mainly through hematogenous dissemination . The respiratory and gastrointestinal tracts are the major sources of infection and bacilli travel to the liver via hepatic artery or the portal vein. Furthermore, in most cases, TLA is a finding in immunocompromized individuals with AIDS, diabetes mellitus, chronic renal failure and steroid treatment . In our case however there was no evidence of any immunocompromized status or pulmonary tuberculosis. The prevalence of TLA is just 0.34% in patients with hepatic tuberculosis as shown in a study where the patient’s age ranged from 6 months to 72 years with an average age of 39.2 years . Symptoms of the disease are commonly non-specific and include fever, vague abdominal pain, anorexia and weight loss . Biochemical investigations are highly variable in TLA but in many instances a marginal elevation of liver transaminases with a disproportionate rise in ALP, prolonged prothrombin time, and a reversed albumin globulin ratio are commonly seen . Our case also had similar findings with mild derangements of liver transaminases and an increased alkaline phosphatase level. TLA is frequently confused with hepatoma, pyogenic liver abscess and amoebic liver abscess . Because of the non-specific clinical presentation, the diagnosis is usually made at autopsy or occasionally during laparotomy . Caseous necrotic material in TLA may contain acid fast bacilli (AFB), therefore, aspirated material or a biopsy of the abscess wall can be used for direct demonstration of AFB and for culture. In our case the direct demonstration of AFB in the aspirated material along with the temporal pattern of the patient’s symptoms helped us to make the diagnosis of a subcapsular tubercular abscess of the liver. Routine cultures from the aspirated material for bacteria and fungi were sterile in our case. However, due to limitation of resources culture for M. tuberculosis by means of molecular diagnostics could not be done. Medical treatment of tuberculous liver abscess is still a subject of debate. According to one postulate the thick fibrous tissue around the abscesses and their large size may prevent antibiotics from reaching the target . Antitubercular therapy is usually recommended for 1 year. Percutaneous drainage of the abscess, combined with systemic ATT has also been used in some cases . This is a rare case of an isolated primary tubercular subcapsular liver abscess without any other foci in an immunocompetent adult. The clinical presentation of an isolated TLA is highly atypical and it poses a diagnostic challenge to the treating physician. The prognosis of tubercular abscess of the liver is excellent in the majority of patients diagnosed early with prompt institution of therapy. Hence, there should be a high index of suspicion for this disease when dealing with a space-occupying lesion of the liver so that specific treatment can be instituted as early as possible. Essop AR, Segal I, Posen J, Noor Mohamed N (1983) Tuberculous abscess of the liver. A case report South Afr Med J 63:825-826. Balsarkar DD, Joshi MA (2000) Isolated tuberculous hepatic abscess in a non immunocompromised patient. J Postgrad Med 46:108-109. Roy R, Goyal RK, Gupta N (2000) Tuberculous liver abscess - a case report. J AssocPhysInd 48:241. Hayashi M, YamawakiIokajima K, Tomimatsu M, Ohkawa S (2004) Tuberculous liver abscess not associated with lung involvement. Intern Med 43:521-523. Koksal D, Koksal AS, Koklu S, Cicek B, Altiparmak E, et al (2006) Primary tuberculous liver abscess: a case report and review of the literature. Southern Med J 99:393-395. Kubota H, Ageta M, Kubo H, Wada S, Nagamachi S, et al (1994) Tuberculous liver abscess treated by percutaneous infusion of antituberculous agents. Intern Med 33:351-356. Gracey L (1965) Tuberculous abscess of liver. Br J Surg 52:442-443. Chen HC, Chao YC, Shyu RY, Hsieh TY (2003) Isolated tuberculous liver abscesses with multiple hyperechoic masses on ultrasound: a case report and review of literature. Liver Int 23:346-350.